Safely outside the comfort zone?! I’ve been preaching for a year to everyone who will listen that you have to step outside of your comfort zone to experience exponential growth. That which is truly exciting and phenomenal waits in that place we are too often afraid to venture. Well it’s time, as they say, to “put my money where my mouth is”. I have entered excerpts from my first novel in a publishing contest for fiction that heavily relies on public voting to progress to the final round. Having publishing editors and trusted friends read your work is one thing. Opening it up to the general public (which just so happens to include colleagues, acquaintances, ex-boyfriends, friends of friends, and other writers- just to name a few) is another disturbing thing altogether. For some reason, stepping on stage as an actress in front of an audience hasn’t caused me to feel so exposed. I know what you’re thinking. Don’t writers write to have their work read? In theory, the answer is yes. Though we claim to write for ourselves, we all desire the approval of others. What if people read it and hate it? What if they criticize it to others? What if, worst of all, they are completely uninterested? What if I don’t get any votes? Well, obviously, I will die. They will drag my stiff, cold body from the keyboard, put me in a box, and bury me in the ground. That’s ridiculous, of course. The most important thing we can do for ourselves is face fears and take a chance. What are worse than the above questions are the other questions which would go forever unanswered. What if someone likes it? What if it could have been a success? Anyway, in a few days the contest goes live and I will start promoting it. If you want to follow it (or better yet, vote) visit http://www.nextbestauthorcontest.com/voting-info/ on May 1st. The point is that everyone has dreams and plans that were thwarted by fear. 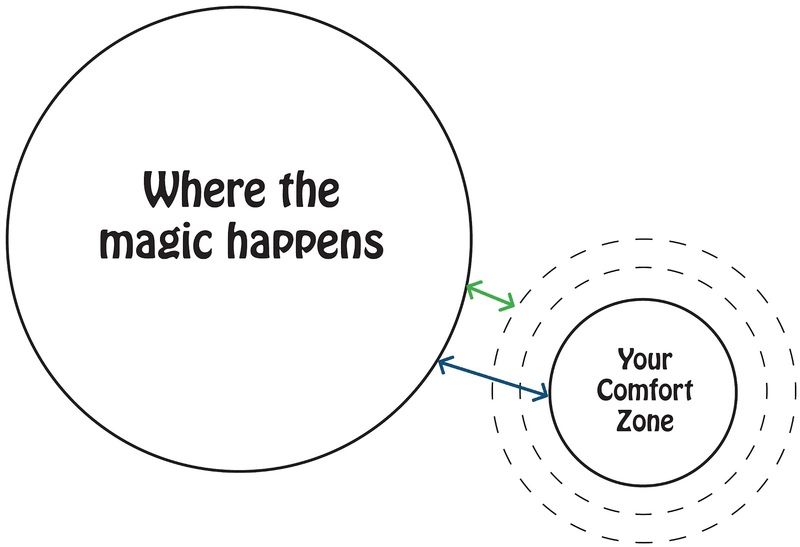 So, is it safe outside the comfort zone? I’m not sure, but I’ll find out soon. If fear of failure is holding you back in your life, I challenge you to re-evaluate the risk. Pick up your left-behind dreams. Reorganize those cast-aside plans. I hope to see you there, outside the zone. If you see me, say “hello”, so I can give you a smile, a thumbs-up and an encouraging pat on the back. We’re all in this life together! This entry was posted in comfort zone, creativity, Inspiration, optimism, publishing, publishing contest, taking chances, writing. Bookmark the permalink.